Edit red text color to your target URL, edit blue text color to your image source URL. So glad to receive any comments or bug reports. I wanna comunnicate with you! U have an email? I'm use 1 template that you did and wanna change one thing, but I've tried everything and failed! U can send me an e-mail at nossovicio@gmail.com. mbak mbong maksute ini apa yahh? Below is a list of obsolete or deprecated HTML. If an element is listed without an attribute, the element is considered obsolete or deprecated. If an element and attribute are shown together, the attribute is considered obsolete or deprecated. aku nyoba bikin template sendiri kok ga bisa yach? hi. 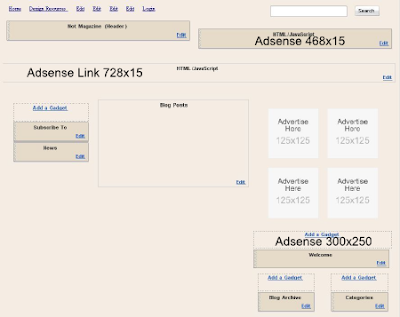 how much do you charge for a custom template? thanks? preferrably 3 columns. wah makin pinter aja bikin templatenya..ajarin dunz!! sing ono slide-e endi bong? nek sing iki lanang pol!!! 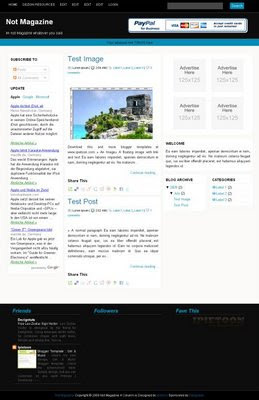 Very cool magazine Blogger template, I can see your professionalism from this template! I downloaded this template... It´s Cool... Im From Colombia... But.. I want that the comments allows do it as Name / URL or Anonymous. Thank You Very Much for your HELP.... It Was Very Easy... =) The last... How change the Continue Reading for Leer más?... I speak Spanish and mi blog is for SouthAmerica and Spain. gmn caranya ganti nama navbar menu dri btempelates.com..yg cupcake .???? tolongin yah.. !!! plz,d blz..
Ih cool bangrt! mas, belajar buat template dari kapan, waktu umur berapa? Hi. I Have a problem with the comments. This don't allows see the code for validate the comment. Only if have google or other, but Name/URL or Anonymous nothing..
@fabio:everything ok..if you're login, and you give your own comment, as blog owner you will not see validation code. i've tried digg, it works. This is the only thing that stands in the way of a perfect template! Never mind...I found the problem...Thanks! hi, very nice template, congratulations. There is only a little problem: using Internet Explorer and a laptop (with 15" screen), the posts are not boxes but they become wide and with all the things written inside that go outside and you can't read them all. it happens to me too, that said by Marco. With Explorer 8 and a laptop, this template cannot be used properly. Is there any easy way to edit the post snapshot from the first page? I'm losing all my formatting and it's looking like a run-together mess. i have tried to download your template. it says it is being shared thru box net. but then when it says the download is complete it says error unable to read code. i have been trying for half an hour! Hi, I really like this template, but I would like to reduce space between post title and post content, could you help me? bost sedot ya nanti buat blog baru. terus berkarya boss ya. Superb templete, after long time i chenged my templete after seen this, see my funny blog http://indiankhichdi.blogspot.com/, its looking so nice, thanks. Mba, klo mo lebarin bagian post body gmana?? would you write in English please? Templatenya bagus, terima kasih saya sudah pasang template ini di blog saya, Kalau mau pasang iklan di tengah posting secara otomatis gimana yach? gan, baru lihat sekali langsung suka,ijin download ya , buat di jajal dulu, ntar kalo dah ngerti , atau ada update annya saya komen lagi, btw thanks gan whoever you are..
Not magazine is very nice and more interesting magazine so that can be enjoy it. Mostly are very like it and enjoy it in this post.It has design the good creative activity.